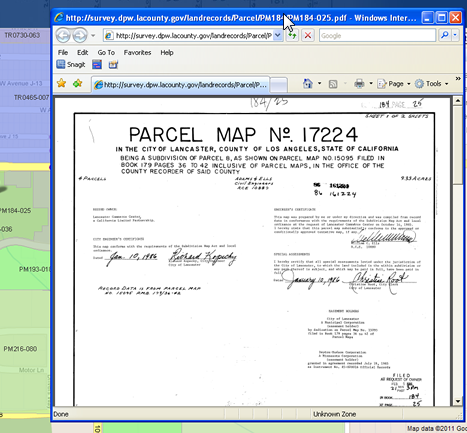 The Land Records Viewer is a map-based web application that allows users to search and retrieve Tract, Parcel, Records of Survey, and Centerline/Corner Record documents. I. If the location of the desired document is known, simply click on the Address/Intersection Search field box and either type in an address, e.g. 900 S. Fremont, or an intersection, e.g. 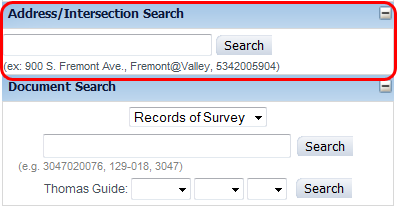 Fremont@Orange, and then click on the Search button (or press Enter) and the viewer will automatically zoom to the area specified as shown in the second example below. **Note: Because there are multiple streets with similar names, make sure to indicate whether it is a st, ave, blvd, etc. so that the viewer can direct you to the correct street. II. 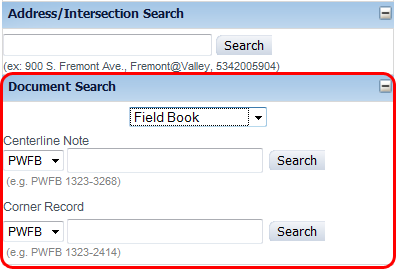 If specific information is available regarding your search, such as the AIN (Assessor's Identification Number) of a parcel, book and page number of document, or Tract, Parcel, Record of Survey, Centerline/Corner Record, name or number, simply enter it in the Document Search box. Also, the document search box's pull down menu allows you to select the type of document you want to query. For Tract by AIN, type the number as is. No need to include dashes. e.g. 3047020076. For Tract by Book/Page - type the book and page using the following format: Books are always 4 digits and Pages are always 3 digits with the exception of a,b,c pages. e.g. 1234-123 or 1234-123a. Note: For instance, if the first 3 or 4 digit of the tract number is known, the viewer will list all available tracts that matches with those 3 or 4 digits. Users can then click on the zoom button located on the right side of each listing and the viewer will zoom to that tract. For Parcel by AIN, type the number as is. No need to include dashes. e.g. 3047020076. For Parcel by Book/Page - type the book and page using the following format: Books are always 3 digits and Pages are always 3 digits. e.g. 123-123. For Parcel by Number. - Parcel Maps are generally identified by number only and vary in length and format. There is one exception for early Parcel Maps which were named "PARCEL MAP". e.g. 38680, 2004-5879, 069868, or PARCEL MAP. For Records of Survey by AIN, type the number as is. No need to include dashes. e.g. 3047020076. For Records of Survey by Book/Page - type the book and page using the following format: Books are always 3 digits and Pages are always 3 digits. e.g. 123-123. 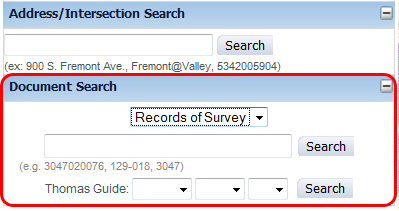 For Records of Survey by Thomas Guide.- select a page and grid value (row value is optional). e.g. page 458, grid J. For Field Book Centerline notes by Book/Page - type the book and page using the following format: Books are always 4 digits and Pages can vary in length and can be alphanumeric. e.g. 1234-10, 1234-100a. For Field Book Corner Record notes by Book/Page. - As with the Centerline notes, type the book and page using the following format: books are always 4 digits and Pages can vary in length and can be alphanumeric. e.g. 1234-10, 1234-100a. I. Hold down the left mouse button to drag map in any direction. II. Double-click any where on the map to zoom in. III. Roll the mouse roller (if the mouse has one) to zoom in or out. IV. Use the navigator located on the top left corner of the map to zoom in or out and to move around. V. Using the plus (+) box allows you to zoom in to specific areas and using allows you to zoom out. VI. Holding the SHIFT key and dragging the mouse creates a zoom in location box. Using SHIFT+CTRL keys and dragging the mouse creates a zoom out location box. By clicking any of the check box options located on the top right corner of the map titled Layers, users can turn on or off various layers available to them. 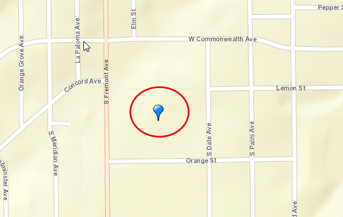 Documents that are available for viewing will have symbols/shapes displayed on the map. 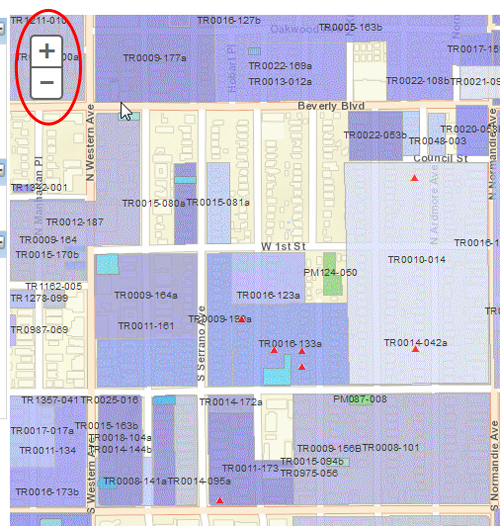 To retrieve a document, click on a shape/symbol on the map and the results will show up on the left hand panel. Next, click on a link under the PDF column. Once clicked, a PDF of the document will pop up in a separate window. Note: If there is no document, you may need to adjust your pop-up blocker settings. Please go to Troubleshooting. 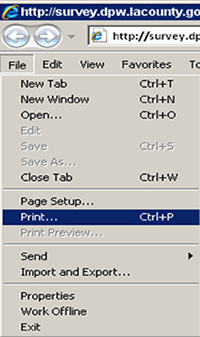 To print, click on the print icon located in the toolbar or click on the file menu, scroll down, and click on print. If documents do not appear in a separate pop-up window, please double-check your pop-up blocker settings and ensure that pop-ups are allowed for this website. If the map is slow to load, try turning off layers that you don't need.